alaTest ha raccolto ed analizzato 288 recensioni su Philips BG2036. La media della valutazione per questo prodotto è 4.4/5, confrontata con la media della valutazione di 4.3/5 per altri prodotti. Abbiamo analizzato differenti valutazioni di esperti ed utenti, età del prodotto ed altri elementi. A confronto con altri prodotti, Philips BG2036 ha ottenuto un alaScore™ complessivo di 85/100 = qualità Molto buono. When you want to get rid of the hairs on your back by yourself this groomer with the extension will make it a lot easier. I find it works better if you keep on top of your grooming. This body groomer struggles if you have a lot of hair. Easy to hold. Great extension for back. Nice and smooth after. Used this yesterday and it's the best body groomer I have used by far! 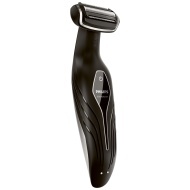 Close shave and long handle makes back hair easy to reach! Excellent item, super quick delivery to store at a great price, considerably cheaper than elsewhere, thank you! Used once, never again. It has now been put in the bin ! !